DDLimo does not rent its vehicles out by the hour, but instead on a per trip basis, saving our customers, in many instances, hundreds of dollars. We are a pickup and drop-off service only and we operate in all of Allegheny County as well as some parts of Washington and Butler County. The price depends on your distance from downtown Pittsburgh. We charge on a per person per trip basis. The farther your area is from downtown Pittsburgh the higher the price per person rate. We charge $5, $8, or $10 per person depending which area you are getting picked up from and going to. Each trip is subject to a price minimum. The farther out from Pittsburgh the higher the minimum fair. View our affordable rate schedule here. 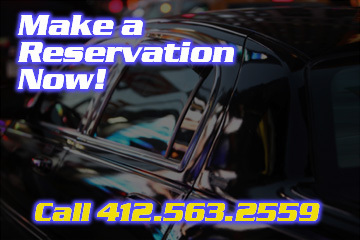 To schedule a car for your upcoming evening out please call 412.563.2559. We take reservations up to 3 months in advance. The farther you call in advance the more likely we will have the times you are looking for. At off-hours just leave a message on our answering machine and we will get back to you. We return phone calls every day except Sundays. We look forward to serving you and your party! Give the gift of luxury transportation from DDLimo! Surprise that special someone with a gift certificate to transport their party for a birthday or anniversary. Any occasion you’d like to help them make more special. Call 412.563.2559 today. Allow 7 business days to receive your gift card.